If you had to choose ONE product that would give your Pomeranian more happiness than you could have thought possible, it’s the humble playpen. A great playpen with the right set-up can affect your Pom’s daily life in a variety of ways so let’s have a look at the reasons for this. 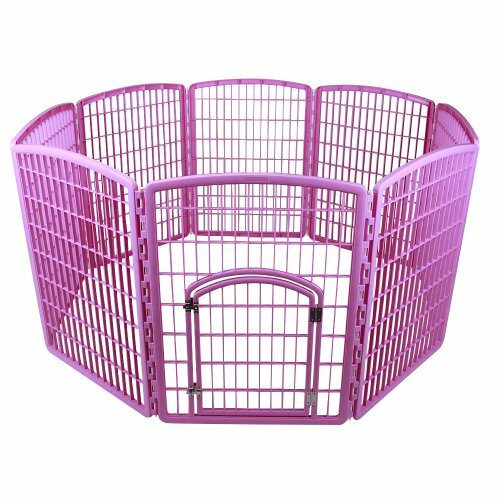 Playpen for Pomeranian vs Crate for Pomeranian. 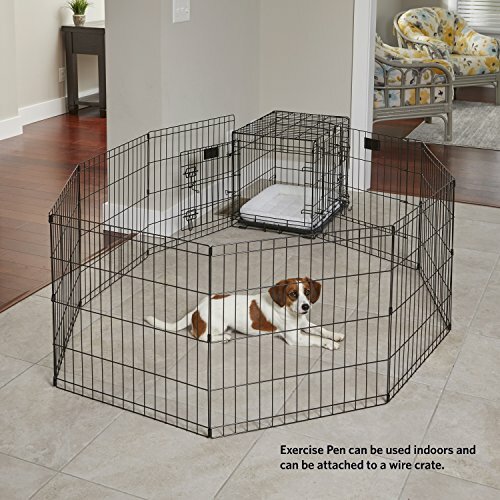 FACT: There’s a gigantic difference between a playpen (also called an exercise pen) and a crate (also called a cage). The crate: Crates used to be a popular method for keeping your dog in one place when you couldn’t watch him and/or as a place to sleep. They don’t help with house-training and often work in the reverse. The positive news is that they’re rarely used today because they’re small, claustrophobic in nature and can cause emotional and physical stress in your dog. The playpen: A playpen is more spacious, with difference spaces for sleeping, eating and eliminating. They’re comfortable, help with house-training and make your dog feel safe and happy. To prevent destructive chewing. If he’s teething or may simply love chewing, you’ll soon learn that he’ll chew anything he can, and even try things to see if he can or can’t chew them. If you’re watching him and you see him heading for something that’s NOT one of his toys, you have two choices. Either use a corrector spray as it sprays a short burst that stops your dog immediately, or clap your hands loudly. Then give him a toy to chew instead. If you can’t watch your Pom, put him in his pen because he’ll have plenty of toys to chew and you won’t worry that he’s getting into mischief. Eventually, by monitoring and changing his behaviour, he’ll stop chewing things that aren’t for him on a permanent basis. To keep your Pomeranian safe. Your Pom’s safety is a major priority for you so you should go through your house, preferably before you even bring your puppy home for the first time, but also on a routine basis, and “puppy-proof” your home. Electric cords are a popular chewable item but can be lethal if charged. Cords can be concealed or moved off the floor so he can’t get to them. Socks are a source of interest because they have the scent of the wearer. Anything on the floor or anywhere within his reach can be hazardous to his health. This includes: dropped paper clips, pins, needles, pen caps, coins, wrapping from food and so on. You may also drop food that’s poisonous to dogs or other things equally harmful. Keep all cleaning products in a closed cupboard. You need to crawl and even lay down on the floor so you can see things through the eyes of your Pom. The safest place for your Pom is in his pen, especially if you’re not home or can’t watch him. An important point: ALL members of your family should be made aware of the dangers facing your Pom. They may drop something that seems innocent enough to them but your Pom could be harmed by it. 1. Separation Anxiety (SA). This is a major problem with dogs, especially puppies if they haven’t lived with you for long. 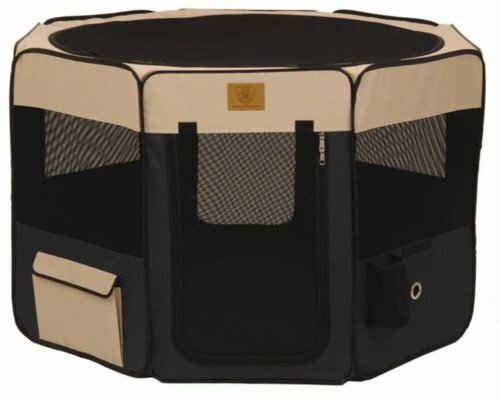 The playpen is designed to keep him happy and ease any anxiety he may feel. Most breeds face this at times but for some reason, Pomeranians are more prone to it as they’re developed as lap dogs, in need of human interaction as much as possible. They may feel lost, lonely and have overwhelming feelings of isolation. Creating a safe, comfortable environment will ease these feelings. Bigger spaces can make it worse. If he has the whole house to himself, that is worse than only having his pen. A good quality bed, toys, food and water and room to move are all aspects of a playpen that need to be designed properly. Have some pee pads in his toilet area so he doesn’t soil the rest of the pen. Dogs don’t often mess their own possessions, especially if you have set up a space for him to do his business when you’re not around. He can chase his round toys around the pen and they can’t escape. Companion and speaking toys are ideal. Have looped relaxation music playing nearby to calm him. Summary of the Benefits of Using a Playpen for Pomeranian Puppy. Keep your Pomeranian secure and safe. Prevent him from chewing items he shouldn’t chew. Make him comfortable because of his bed, toys, water, food and bathroom area all being in one space. The pen needs to be a good size so it doesn’t feel like a cage. Instead, it should feel comfortable and safe. It must be portable so it can be placed in any room and even taken when you visit friends or family so he can still feel comfortable, despite being around strangers. It’s essential that it has a door because your Pom shouldn’t associate his pen with anything negative (e.g. like you going out). While you’re home, leave the pen door open so he can roam around, but can also get a toy from there or even have a nap. 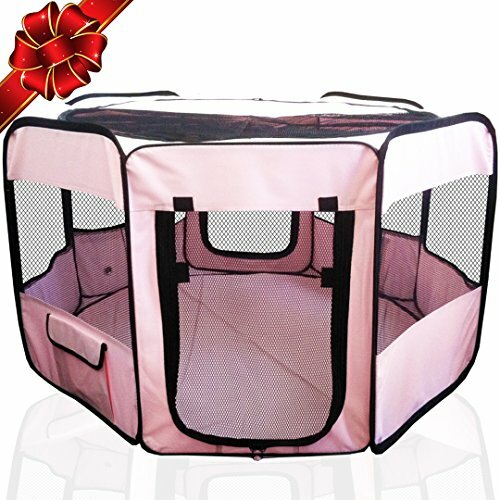 Best Playpen for Pomeranian Puppies. 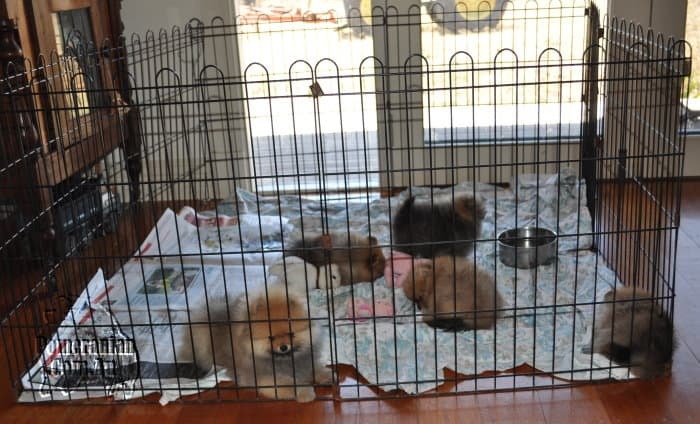 I use a playpen for the Dochlaggie Pomeranians and recommend the following puppy exercise pens. You have two main choices, depending on your Pom’s needs and what you need from it. Mesh/cloth pop-up playpens. These are great if you have carpet as they protect the carpet. They’re similar to a room in that there’s a floor, walls and a roof (if needed). The door is either a Velcro or zipper flap. They’re made from mesh and washable/breathable cloth and open a bit like pop-up tents. They can be used indoors and outdoors and many of them also have a carry bag so you can pack up easily for travel. Gated, heavy-duty plastic pens. The other fine choice. If your home has tile, wood or other flooring types, they’re easily cleaned. There’s no roof and the sides have gates that your dog can look out if he wishes. The better quality models use a heavy-duty plastic that’s moulded, simple to clean and long-lasting. Some have doors and others don’t but it’s better to have a door. If you’re concerned about your Pomeranian’s safety, consider the purchase of a pen with a lid.